This is occasionally used as a synonym for ‘ghost load’ a lantern connected in parallel with a stage-practical to ensure the dimmer has enough load on it. More usually it’s a light on a pole left on-stage while nobody is about. The practical advantages are that the last people out & first people in won’t fall in the orchestra pit in the dark. Do I need to use a Ghost Light on my stage? 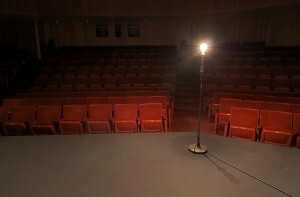 If there are multiple entrances to the stage when the building is dark and empty, a ghost light should be used to prevent anyone from injury walking into objects or falling off the edge of the stage. If there is a clearly visible, illuminated working light control at a single stage entrance, it may not be necessary. Nowadays a low energy light source should be used; either a compact fluorescent lamp or an LED lamp. Any openings through the stage floor should be adequately protected at the end of each performance – the protection (safety railings / barriers etc) should only be removed when the stage crew have completed their setup the next day, just before the show starts. The historical reasons for it’s existence (gaslights acting as pressure relief valves, keeping the ghosts away, keeping the ghosts happy, ensuring the theatre never ‘goes dark’ etc.) are many and varied : some are listed below. The urban legend behind this (as I was told many years ago) was that a burglar had broken into a theatre one night before the advent of the “ghost light.” He fell off the stage, breaking a leg or two and was found that way in the morning. Although he was trespassing, he sued the theatre for creating an unsafe workspace and won. So ever since, we leave a light on to protect ourselves from liability. There is much about this story that is apocryphal. I prefer the “Ghost light” explanation where we leave the light on to keep the theatre ghost company overnight. Apparently when all the lights go out, the ghost thinks it has been abandoned and causes accidents to happen on the set. The light DSC on the stage in the USA that is left burning while the building is vacant was a fire code requirement in NYC back in the old days to my knowledge. It was there to allow firefighters to see where the stage stopped and the orchestra pit started. This is still a valid reason for putting one out today. So far as the name is concerned, can’t really say. Who else is in the building except ghosts when the light is deployed? Practically, So I can find my way to the backstage mains switch when I come into the theatre. 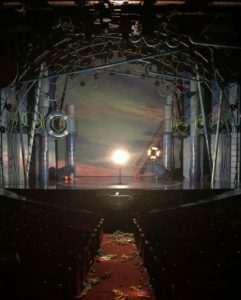 I had heard that one of the first rules that Actor’s Equity adopted, when the union was first organized, was that a light must be present in a theatre for rehearsals so that the pianist could see what he/she was playing and that a producer did not have to call an IATSE crew just for rehearsals. In the years that followed, it became a common practice to leave a light on stage for safety sake and somehow the name of ghost light was used for that light fixture. It’s also known as the “Equity Light” or “Equity Lamp”. It’s a term for the light/lamp that’s turned on when all the other lights are turned off and the theater is locked up for the night. I suspect it’s mandated by the rules of Equity, the Actors Union. I’ve found it on various web pages relating to locking up — and as a reference in “Tex and Molly in the Afterlife”.